Added a configuration option for the blink interval, in milliseonds, of the eye-movement-detection algorithm. 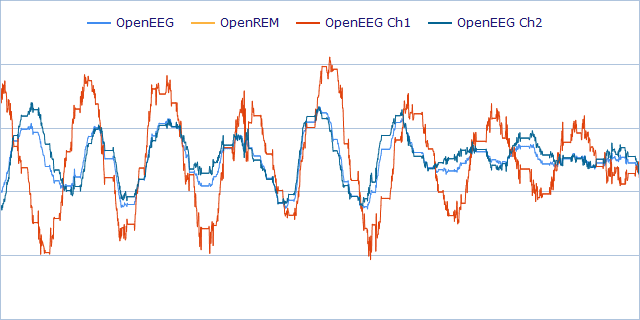 Added a new channel, OpenEEG RAW, that implements the Illuminated Interface and averaged out the OpenEEG channel. Added trigger algorithms and charted the eye movement count before the audio track threshold is reached. Made the amount of channels configurable and fixed the averaging in the main channel. Added refresh context menu to the port selection form. A video made by a follower with an epic track showing the OpenEEG plugin. Michael blogged about his project with OpenEEG from Olimex, he made dreams recorder http://lsdbase.org/2013/05/24/Open-Electroencephalography/ and he is able to communicate inside his dreams with morse code http://hackaday.com/2012/06/20/communicating-from-inside-your-dreams/ and record his blinks for further data analysis when wake up. How cool is this? Added the first draft of the REM-detection algorithm.